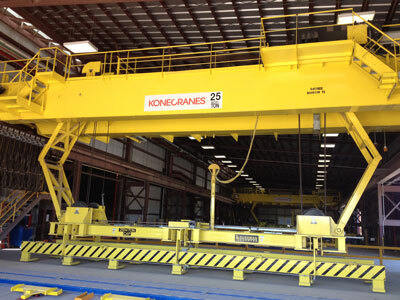 Bushman Equipment, a manufacturer of custom-engineered material handling solutions, recently retrofit an electro-mechanical plate lifter to hydraulic drive. The material was delivered to and the work was performed on-site at SSAB’s Axis, Alabama mill. SSAB is a leading global provider of high strength steel plate. The lifter is used to lift 40’ long plates in a packaging operation. The original electro-mechanical drive was designed simply to move the unit’s lifting legs in and out in order to lift single plates. But SSAB discovered that efficiency could be improved if the lifter could straighten and lift a multi-plate stack. The solution was a hydraulic drive system capable of producing sufficient squeezing force to straighten the “shuffled” plate stack. Bushman specially designed a hydraulic package that included four hydraulic cylinders to generate the required force. Bushman’s main design challenge was determining the working forces that the existing lifter structure could safely withstand.